Let's start with a brief discussion of modern portfolio theory (MPT) just to make sure we're all on the same page. To avoid a less than exciting academic foray into MPT, I'll provide a basic definition. Basically, the theory is that individual investment (a particular asset i.e. stock or bond) selection should not be chosen on their own merits. What's more important is how each asset's price moves relative to all the other investments in a portfolio. Harry Markowitz was the first to articulate this concept back in 1952. The market is one of extremes and MPT is seen as the answer to those extremes. Experts will tell you all day long that the average annual return in the market for the last 100 years is between 8-10% (depending on what they are calling “the market”). But in reality, there are very few years where the market returns 8% as an example. Care to guess how many times the average annual return has been between 8-12%? Well, since 1926 it's only happened five times. Yep, that's right. In the last 86 years, the stock market has had five years that were average. So, what's happened the the other 81 times? It's a mixed bag of extreme highs and heart-stopping lows. Okay now to get more specific, let’s look at a chart that I like to call “the periodic table of investment returns”. 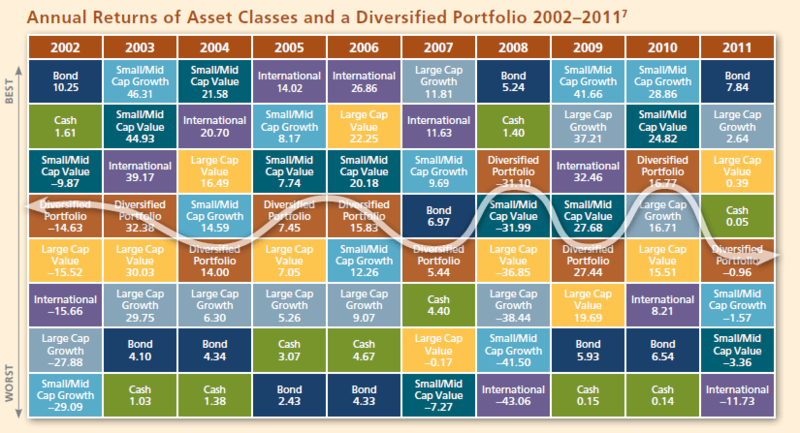 This one is constructed using data from Lipper (a third party company that compiles market data) and it gives us a snapshot of how a “diversified portfolio” performed for the last 10 years (2002-2011). 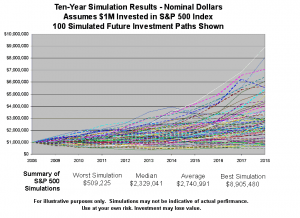 These charts are put together to prove to you, the consumer, how undeniably awesome modern portfolio theory works (MPT) and how the use of a balanced or diversified portfolio is the greatest idea Wall Street has every conceived. In typical insurance pro blog style, we’re going to use all the wonderful research that Wall St. has commissioned and use it to tell a different story. Does modern portfolio theory really work? Certainly, we can all see that over this particular 10 year period we have varying rates of return from year-to-year as one would expect. If we calculate the average annual return (arithmetic mean) we get 7.3%, however, if you go read my post on compound annual growth rate (CAGR) then you’ll understand that’s not the number we should be concerned with. The CAGR is only 5.6% which is the number that really matters to anyone who actually has money invested. Only the Wall St. marketing machine cares to mention average annual return numbers. Because they’re allowed to use those numbers in promotional literature and they always look better than CAGR. So, this begs the question. Why would I risk having a -31% year like we had in 2008 to get a 5.6% compound annual growth rate over ten years, when I could have gotten a similar return inside of a good participating whole life contract or indexed universal life contract? Wouldn’t it be better to take advantage of the stable values inside of an insurance contract and have the ability to purchase stocks when market is tanking? After all, the financial experts are always telling us that the perfect time to invest in the market is when the market takes a significant drop. I believe this should be the basis for all investment decision, however, it's easier said than done. I don't know about you, but I'm pretty emotional about my money? And I hate losing it. That's why I don't gamble. Not passing judgment on those who enjoy Vegas or poker night with friends but it feels as natural to me as dumping boxes of cash in my fireplace to start a fire. You wanna know the best defense against market volatility? Decrease your exposure to the market. Pretty simple. The less money you have in the market, the less chance you'll have of experiencing the wild gyrations that come along with it. If I’m continually investing into a strategy that has the potential to fall precipitously at any moment without any warning, then I don’t have much opportunity to buy into the dips. In my past life, I saw the impact of a retired person beginning to take withdrawals from a diversified portfolio. Traditional financial planning says that when you’re going to retire and begin taking income from your portfolio, you should pick a coupon rate…say 4-5% that you will withdraw from your investments every year, no matter what your return is for any given year. 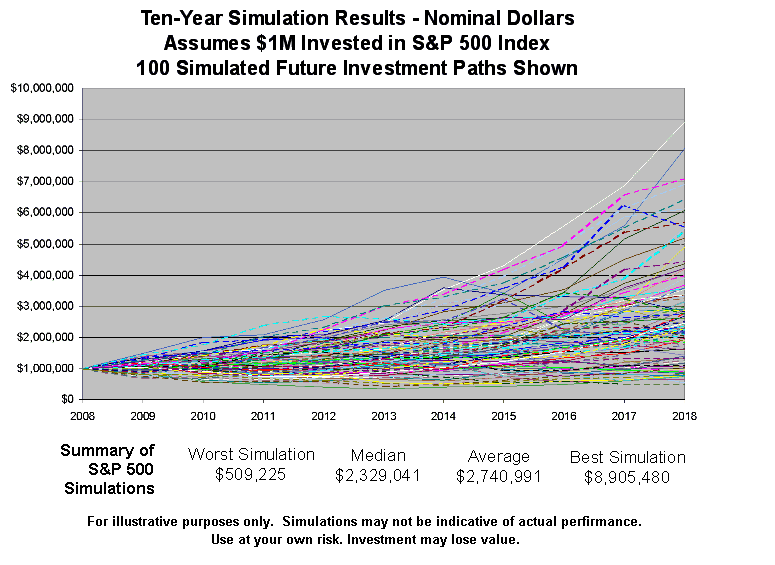 Sidenote: There’s even fancy software that will run a bazillion scenarios, called monte carlo simulations to project the probability of you running out of money based on historical returns of a particular portfolio mix. I don’t want to wander too far down that dark and winding road because mostly it’s purely academic and has no basis in reality. What happens if I started my retirement in 2008 and the first year I had been down 30%? It’s a complete disaster for your retirement if you’re using the method of income as I mentioned above. You need must have stable values that don’t fluctuate wildly during your non-income producing years. Unfortunately, no one plot the expansions and contractions of the market so that you can benchmark it to your retirement plan, that’s just not reality based planning. So, if the compound annual growth rates are basically the same in a high quality participating whole life insurance policy or indexed universal life insurance policy, why bother risking the crazy ride? It’s better just to have the stability in your plan. If you’d like to learn more about our view of modern portfolio theory or just how we can help you with the sort of strategy that was discussed in this post, contact us for more information.